Short Run CD or DVD Copying is a simple process if you start with a Premium Blank Disc and a professional printing Process such as Silk Screening or Thermal Re-trasfer. So what is a Premium Disc? Your purchase is backed by our normal 100% swim-through-alligator-infested-waters-to-use-these-Discs-money-back-guarantee, which means if you aren’t so thrilled with these Discs that you’d swim through alligator infested waters to get them back if a friend or co-worker took them from you and went on vacation on a tropical island surrounded by alligators then just let me know and I’ll refund your credit card! How’s that for an iron-clad guarantee?! Click here to receive Free Samples & a Quote! Color Match can be done using the Pantone Color Library (PMS Colors). The actual printing and manufacturing time is 3-5 days after you approve the PDF proof. Frankly we make money from Rush orders. how fast can we make it, how about few hours. Don’t assume it can’t be done, but I guarantee you it will cost more 🙂 Go ahead make me some money and call (800) 819-3362. Just remember I am motivated to ship it on time, otherwise I do not get paid and you get it for free. Standard is 4 colors (CYMK). Spot colors , Panton colors are optional. Yes we do. Our standard turn around time for Qty up to 250,000 is 3-5 business days. Rush fees will apply for shorter turn time. In most cases we can build any of the products in 24 hours and sometimes same day, just call (800) 819-3362. So, what is Silk Screen Disc? CD and DVD silkscreen printing is typically used for printing large quantities of discs. DVD Silk Screening is cost effective for higher volume runs 1,000 Discs and above. You should not buy a Silk Screen machine unless you are producing at least 5,000,000 Discs per year. The investment is about $300,000 for a new setup and about $150,0000 in consumables. You will also need an expert operator with a typical Salary of $6,000 per month. The Process allows you to print full color on the Disc. Production Speed is one Disc per one second after setup. Setup time for an expert is about 45 minutes. Consumables are about $94 per job. Every time you change the graphics that is a new. CD silkscreen printers apply ink to a screen which penetrate areas of the screen that are not blocked by the stencil. The Printing process for CD-R Silk Screening, DVD-R Silk Screening, Blu Ray Silk Screening or Replicated Discs is the same. A typical Silk Screening Machine has 5 Print Heads. These heads can be configured with a variety of color combination from Pantone Color management (PMS) colors to four-color process (CYMK) and metallic. You have many color options in Disc silk screen printing technology than in label printing. Silk Screening allows you to print full Color on the Disc with white and silver background. The result is a high-quality, attractive professional looking Disc, water resistant, scratch resistant, last longer and cheaper to produce in volume. Virtually all Software and Music are Silk Screened. Video Disc (DVD or Blu Ray) are typically Offset Printed. Printing 500 CDs or more can easily be done in a short period of time on a silks screen machine. You should definitely outsource to a company as a first option. You should not pay a setup fees for any quantity because it is built in to the price already. 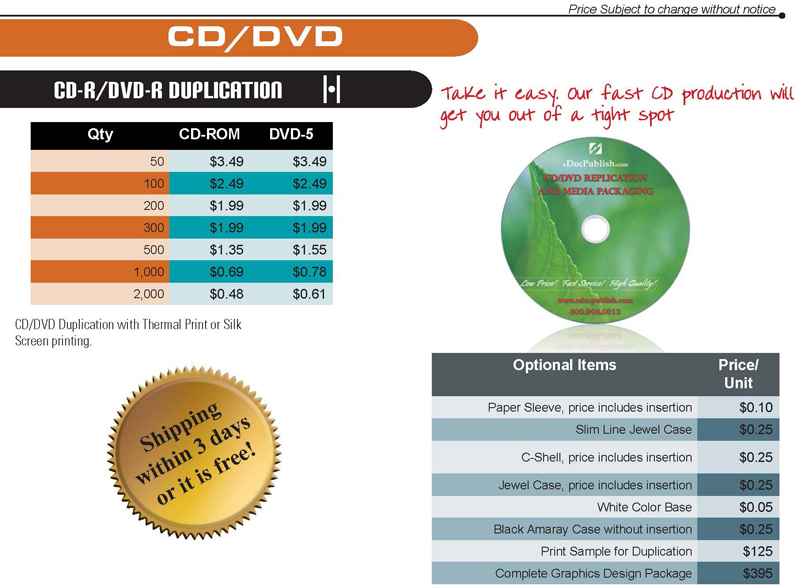 You can get a huge discounts if you print 10,000 CD-Rs or DVD-Rs, and if you order regularly. If you need to print variable data print (VDP) on the Disc (i.e. dates, control numbers, serial numbers, etc.) expect to pay more. Design, Market Research, Manufacturing, Distribution & Fulfillment services. How can eDoc Publish® Help? ”Hey, Nidal, Do you do Design review for my Package?” Yep. “What about Pricing Review?” Yep. “Do you do Graphics Design?” Right again. “Do you just plain old private consulting to help ensure I’m on the right path?” For you? Yes! When your marketing is TIGHT you can grow margins, shorten sales cycles, slash overhead, cut expenses, reduce turnover and build the profitability of your company. To find out if the tips and tactics and strategies We’ve used in our own business since 1997 to become the #1 independent media packaging company in the US and provide for a team of 12 and a family of 9. Please Click her to fill out the form and we’ll set a time for a free consultation to see if it makes sense for us to work together.